Over the last 5 years the popularity of Lip Fillers has exploded. Many Hollywood starlets now have lip filler injected to increase the volume / fullness of their lips. Kylie Jenner has been a very high profile advocate and has gone on to make millions form her lip stick range. The difference between the lip fillers and the skin fillers is the number of cross-linked molecules per ml. In lip fillers, the number of molecules is 2-3 times higher allowing a more fluid look, which prevents lumps and uneven points. Getting the perfect lips requires a combination of skills. As well as training and experience it also requires a good eye and artistic flare.  The before and after pictures of treatments by Sarah are a perfect example of that. As can be seen in the pictures below Sarah believes in enhancing your natural look. Subtly increasing the fullness and volume of the lips. All treatments are reviewed after 2 weeks to ensure all clients are happy. Clients normally opt for a 1ml injection of lip filler, which gives a subtle enhancement to the lips. It is always best to build up gradually if clients want more than 1ml. Lip fullness / volume is normally governed by both our genetics, the ageing process, exposure to UV light and pollutants (especially smoking). A loss of lip volume and definition can be detrimental to the balance of the face as can having excessive upper lip creases (often created by smoking) or mismatched upper and lower lips. What is Lip Filler ? Do nothing differently. Your lips will be cleaned and sterilised at the time of the procedure. Please do not wear any lipstick or cosmetics. Firstly anesthetic cream will be applied to the lips, so that the lips are numb. This will take about 15 minutes to take full effect. 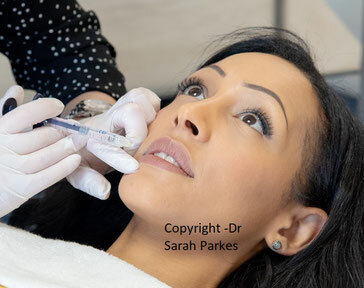 Lip filler will be injected into the border ( where the skin meets the lip itself) and also into the lips themselves in so that the lips have a fuller appearance. You will be able to see the effect immediately. We aim to get the result that you are looking for and will NOT overfill your lips, No trout pout. Hyaluronic acid fillers last around 4-6 months depending on how each individual responds to the filler ingredients. Some people degrade the filler faster than others, everyone is different. If you are slim it is likely that you will metabolize the HA faster and the injections won't last as long. HA fillers are all fully biodegradable and will break down gradually over time. As the absorption times differ with individuals, how the area looks and feels is the best indicator that a top-up is needed. Can I get the filler taken out ? One of the big advantages of HA fillers is that they can dissolved away with an enzyme called hyaluronidase. HA fillers are not permanent. There is usually some swelling after having a lip enhancement and it is advisable to relax and minimise strenuous activity in the 24 hours after having the treatment. Anti-inflammatories such as Ibuprofen can help to reduce the swelling and we will provide you with a cool ice pack to place on the lips. It is important to keep the lips clean and dry and to leave the lips to settle down without any excessive touching or rubbing. If you have an active outbreak of herpes simplex wait until it has subsided. As an extra precaution for those that suffer from herpes simplex would be to take Aciclovir or something equivalent before and after their treatment. Leslie Ash was one of the first high profile casualties of a botched lip filler treatment in 2002. As she has admitted she did not do her homework and had Industrial filler injected into her lips which got mixed up with her muscle. She was left with a large permanent Trout Pout. Hyaluronic Acid (HA) that the Skin Clinic uses is sourced directly from UK pharmacies. HA fillers naturally break down over time and can be dissolved with hyaluronidase. 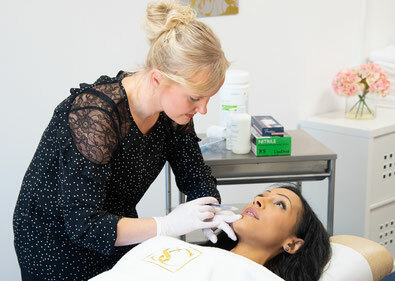 It is worth considering whether a Beautician who may well have been on just a one day course is the right person to be injecting lip filler into your lips.